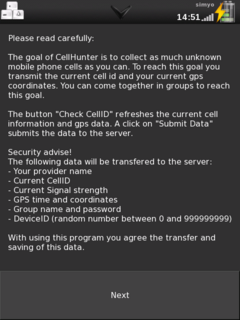 CellHunter is a game with the goal to find as much unknown mobile cells as you can and submit them. You are playing in groups against other groups and collect the information together. Depending on the type of the collected cell you get points. New cells count more points than already known cells. More information at http://cellhunter.omoco.de . The generated cellhunter database by Sebastian Hammerl is published under Creative Commons license. CellHunter ist available in German and English. By playing the game a joint database is build and extended, that maps GSM cells IDs to GPS coordinates. The generated database is published under the creative commons license. These cell IDs can be used for assisted GPS where GPS localization is assisted with GSM cell IDs. In buildings you are normally not able to receive GPS satellite data, but your mobile phone (resp. freerunner) might be able to connect to a GSM transmitter. This information signal strength and cell ID of GSM transmitter can be used to retrieve rough GPS data for your phone even your phone does not have a GPS receiver. 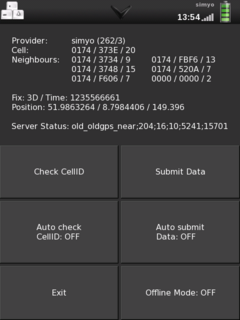 Freerunner as mobile phone has a GPS receiver and so GSM and GPS position and so it is perfect for building up the database. This page was last modified on 28 December 2009, at 07:22.